DoF and Hyperfocal Distance | Portrait Photographer based in Eindhoven, the Netherlands. The Depth of Field (DoF) increases with the distance to the subject, and even becomes infinite beyond a certain distance, which is called the hyperfocal distance. This article tells you everything you need to know about it. If you are more comfortable with a graph you can see below that the hyperfocal is inversely proportional to the aperture number. 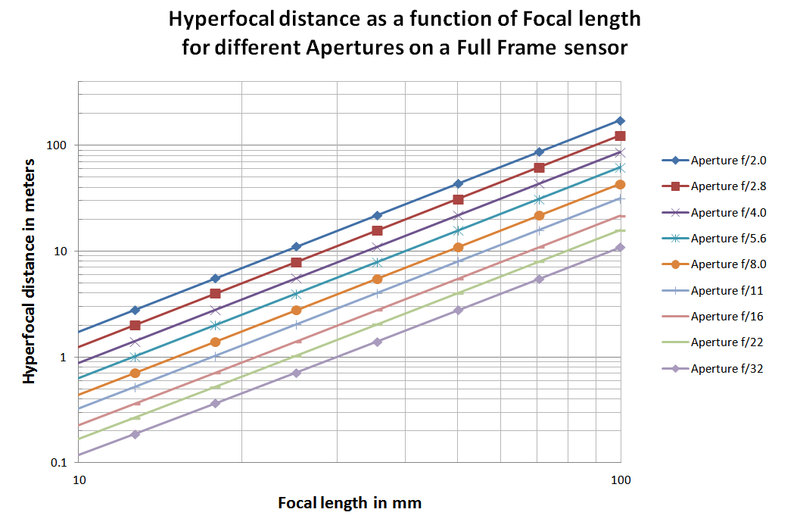 And here is the same graph on a logarithmic scale, which put in evidence that the hyperfocal distance increases with the square of the focal length. 1) When you use a wide angle lens (f<24mm), any aperture will give you an hyperfocal distance of less than 10m, meaning if your subject is more than 10 meters away, any aperture provides a sufficient DoF. Good to know for landscape photography ! 2) When you use a telephoto lens (f>70mm), any aperture will give you an hyperfocal distance of more than 5m, if your subject is closer than that you are likely to deal with a short DoF so pay attention to it ! This is typically the case of portrait photography. 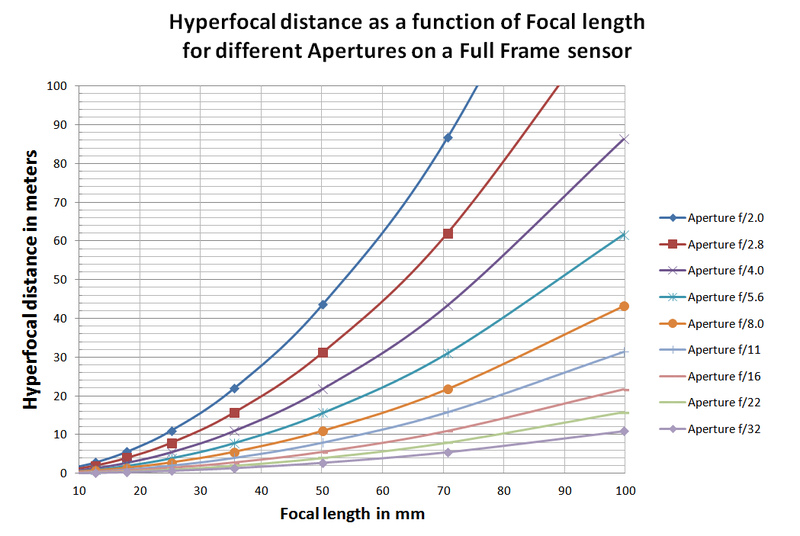 – On a full frame sensor (meaning CoC=0.028mm), an aperture of f/2.8 and focal length of 28mm gives you H=10m. For other values you need to do a bit of calculation knowing that it is proportional with aperture and quadratic with focal length.